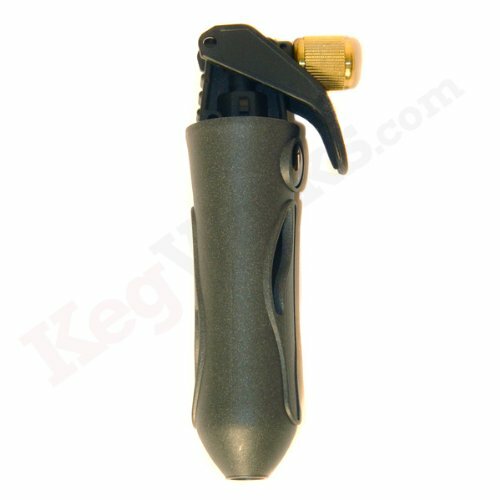 On a private party or picnic when we use hand pump to push beer out of a keg the beer can relatively quickly get stale. What can be done to keep the beer in a good quality for as long as possible? I can imagine that a low temperature and not moving the keg can help. What about air pressure? Is it better to keep it low or higher? I guess that low pressure is better because lower amount of air should dissolve in the beer in such a case. What other factors could influence the beer durability in such a situation? Avoiding agitating the beer and reducing the temperature are the two key ways to slow down the rate of staling, but really once there's air in the beer it's just a matter of time before it goes bad. This uses small CO2 cartridges to push the beer. The advantage being that the keg won't stale quickly since very little air is introduced. If you take off the air pump and start charging it with CO2, and then pump a good bit of beer/foam out of it (to rid it of some of the air), you should have a much nicer ratio of dissolved CO2 to other gases. That plus keeping it chilled and not shaking it (just like you'd treat a can of beer) should help it last a good deal longer. I prefer DrinkGAS. It's a good solution for a party, I use it in my restaurants. Not the answer you're looking for? Browse other questions tagged freshness keg or ask your own question. How to tap beer without CO2, like the germans do?